Election day has finally arrived. Millions headed to the polls across Illinois and rest of the United States this morning to choose between Democrat nominee Hillary Clinton and the Republican candidate Donald Trump as their next president. Voters are also choosing in a variety of state and local races and referendums. The battle in Illinois for the U.S. Senate seat between Democrat Tammy Duckworth and Republican Mark Kirk will be a closely watched one nationwide as Democrats seek to regain control of the Senate. 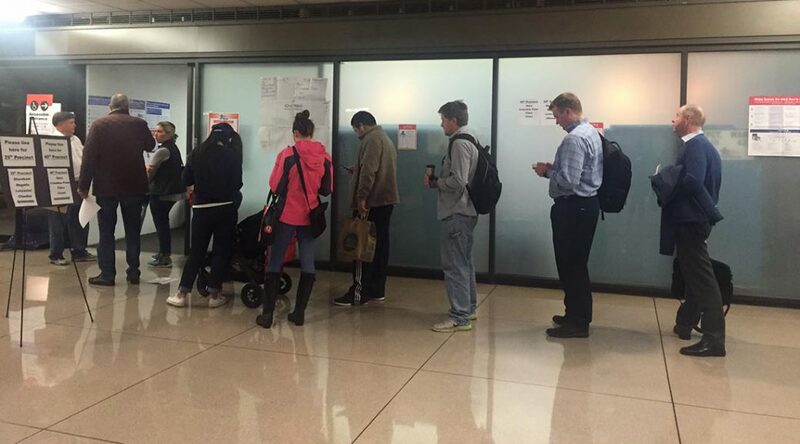 Polls opened at 6 a.m. in Chicago and the suburbs and lines had already begun to form. According to the Chicago Board of Elections, a record number of ballots had been cast in the city from the time early voting opened on Oct. 24. As of Sunday, 352,112 early ballots had been cast, topping the city’s record from the 2008 election. The nation’s early voting numbers surged this year, with votes from about 42 million Americans cast by Monday, according to the United States Election Project. That’s up from 32.3 million early votes in 2012, according to the website. The early voting turnout in Illinois reached 1.27 million on Sunday, up from am early 1.2 million across the state in 2012, according to the Illinois Board of Elections and news accounts. “If early voting is indicative of how it’s going to be today, then I think we’re going to see a very healthy turnout, and it may exceed the prior presidential elections in 2008 and 2012,” Chicago Board of Election Commissioners chairwoman Marisel Hernandez was quoted by Chicago’s local CBS station as saying. Cook County Clerk David Orr was also quoted as saying that in the first hour of voting in suburban Cook County on Tuesday, about 1,000 ballots were cast per minute, and nearly 100,000 people had voted by 7 a.m. Polls close in Illinois at 7 p.m. The presidential election has been an historically bitterly contested one. Clinton arrived in Chappaqua, along with her husband, to cast her ballot at 8 a.m. New York time. Trump was expected to vote in New York later this morning. Many polls showed Clinton with a lead nationally and in key battleground states, but analysts had not ruled out a Trump victory. The nation, and the world, is not likely to know the winner before polls close this evening on the West Coast. The final week of the campaigning saw both candidates travel across the country to get their message out at rallies in states seen as battlegrounds, where, the election will likely be decided. Both candidates campaigned well into the night. Dixville Notch in New Hampshire was the first place to vote at midnight. The residents of the tiny town cast a total of eight votes: Clinton secured four while Trump received two. Former GOP presidential candidate Mitt Romney, who ran against Obama in 2012, received one vote, even though he is not running, while Libertarian Gary Johnson received one.